I love my job regardless of the circumstances, but sometimes certain brides make my job feel like a total blessing. This beautiful bride was a joy to work with from day one. She had such a beautiful vision and put full trust in me to use my creativity to bring it her ideas to life. Her wedding was dreamy, lush, romantic, and was equal parts stunning and fun. She had so many personal touches and really broke from the traditional cookie cutter wedding. I could go on all day about how perfect it was! Tons of different textures of greenery came together with white, cream and blush tone flowers. From traditional roses to smilax, astrantia, ferns, acacia, magnolia leaves, peonies, tulips, and garden roses there was so much to keep the wild and lush feel throughout. The venue is in Downtown Los Angeles and has ceilings and staircases to die for! Also, can we talk about that dress and veil?! All of the details were so well thought out. This wedding was simply amazing. Now here are some shots of the flowers! Personally, I think flowers are for all and for any occasion. Animals may not always agree... but they sure are cute. Here's a few photos from a recent shoot with pittie princess Brooklyn and ginger cat boy Brap. If you follow me on Instagram you might have learned a bit more about me through my posts and stories. If you don't follow me on insta and would like to learn more about my crazy life, I'd like to introduce myself here! I'm Melanie! I started M Floral Boutique in 2016 but have been doing flowers for a while- my first wedding was over 7 years ago. I have a Bachelors Degree from UNLV in Biology with a concentration in cell and molecular biology (currently I'm not sure where my actual degree ended up but I've never been asked to see it so it's all good). I'm clearly not a writer, as you can tell from my jumbled list of facts! I've been married since July 2016 and have two furbabies- a pitbull diva named Brooklyn and the world's jerkiest cat named Brap. Seriously guys, the cat is mean... but he can do tricks and is really precious when he's sleeping so he can stay. I used to own chickens (yes in my Los Angeles backyard), but they were poisoned and my dear husband hasn't let me get any more just yet. My husband is a cinematographer and photographer (he does weddings too sometimes and the pictures of me below were taken by him). My favorite movies are Elf and She's the Man (don't judge) and the Bachelor/Bachelorette/Bachelor in Paradise is my guilty pleasure... who doesn't love getting roses? My favorite flower often changes between garden roses, tulips, orchids, and ranunculus but sometimes it's just whatever is in front of me. Guys, I really love flowers! My passion in this industry is seeing the reaction of my brides and clients when they see their finished product. Bringing to life a vision is an adrenaline rush that is just amazing! 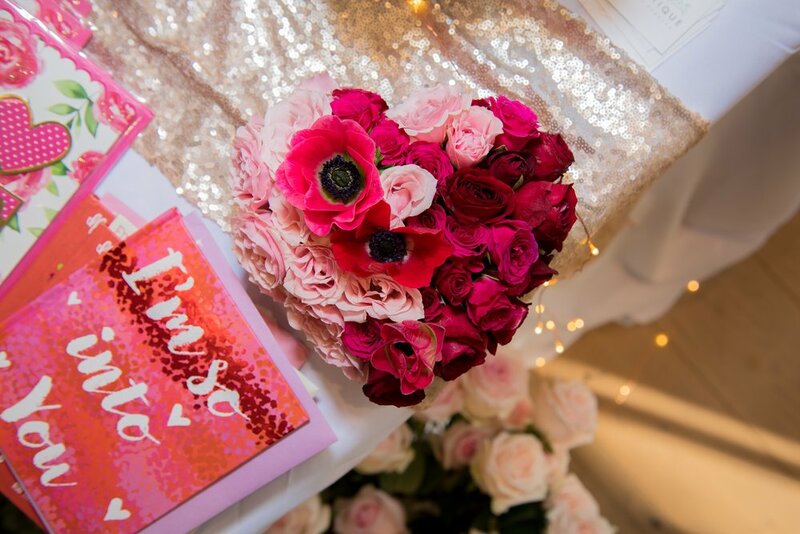 This Valentines Day M Floral Boutique teamed up with Saje Wellness in Pasadena, California for a flower pop up! 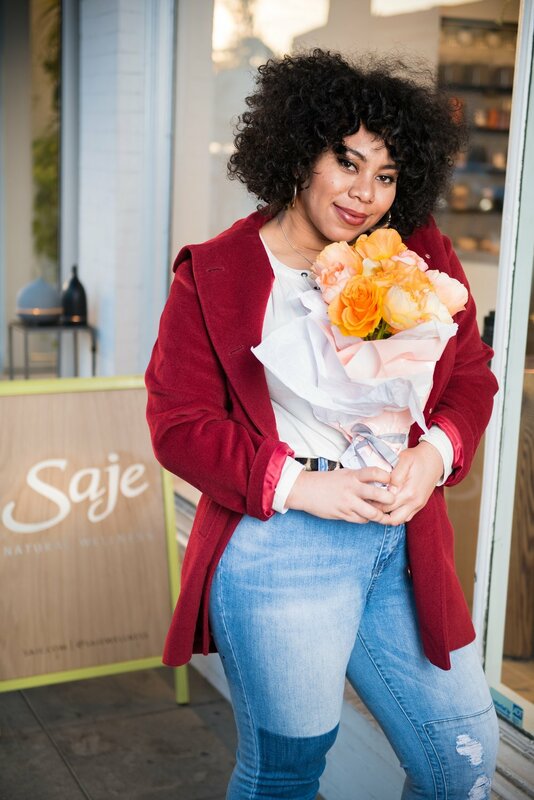 We had so much fun and offered a variety of blooms along with discounts to anyone who bought from Saje. One of my sweet brides over the summer had a simple yet elegant wedding on a private residence in Woodland Hills, CA. Blush calla lilies, ivory and blush roses, and babies breath wrapped in satin ribbon completed the classic look. Photos by Nataly Lemus Photography. Belonging to the family Ranunculaceae (the same family as buttercups), ranunculus are a frilly and round flower coming in many colors. They are available year round (with the peak of availability from January to May), yet can vary in size and price depending on the time of year. 'Ranunculus' translates from Latin to little frog. They come in white, blush, pink, orange, yellow, peach, burgundy, red, plum, coral, black, and green. Starting around Novemeber and lasting til March, the Cloony (also spelled Clooney or Cloni) variety becomes available. The heads on this particular ranunculus are larger and more full. Although coming in at a higher price, their size and lush look well make up for it! Designer varieties of ranunculus include the Japanese Ranunculus, which have limited availability and dappled colors on the petals. These are available from January to April. The water that ranunculus are held in should be changed daily since the stems can dirty the water quickly. The stems often bend and are therefore not perfectly straight. Their vase life is 3-7 days, although I have had many last for weeks with proper care! Overall, ranunculus come in many colors and are a unique and dense flower, but on the downside are somewhat small with weak stems. Despite them being moderately priced, they can become pricey in if looking to fill up space versus more expensive flowers that take up a larger area due to their small size. The look that they provide is beautiful and unique and are personally one of my favorites. Pictured below are two stems of hydrangeas. One was a random stem I picked up at a local floral wholesale supplier and the other was the best I could find at a local grocery store. Both were picked up on the same day within an hour of each other. Both were cut and hydrated with the leaves removed (but not yet placed in the cooler to harden off). I treated them as if they were the same... but they clearly are not. Can you guess which is which? In case you need a bit of help take note of the one on the right- the stem is thin, the size of the bloom is small, and it's covered in brown spots. It's only going to get worse from here... as you may have guessed, that's the one from the grocery store. Now don't get me wrong, you can definitely find great blooms from time to time at the grocery store, but if you have an important event coming up it definitely pays to know that your flowers are of high quality. I hear all the time, "Well I can get that cheaper at the grocery store." Well, yes you can... but like most things in life, you get what you pay for! When flowers are purchased from a florist they go through a cycle called the cold chain. 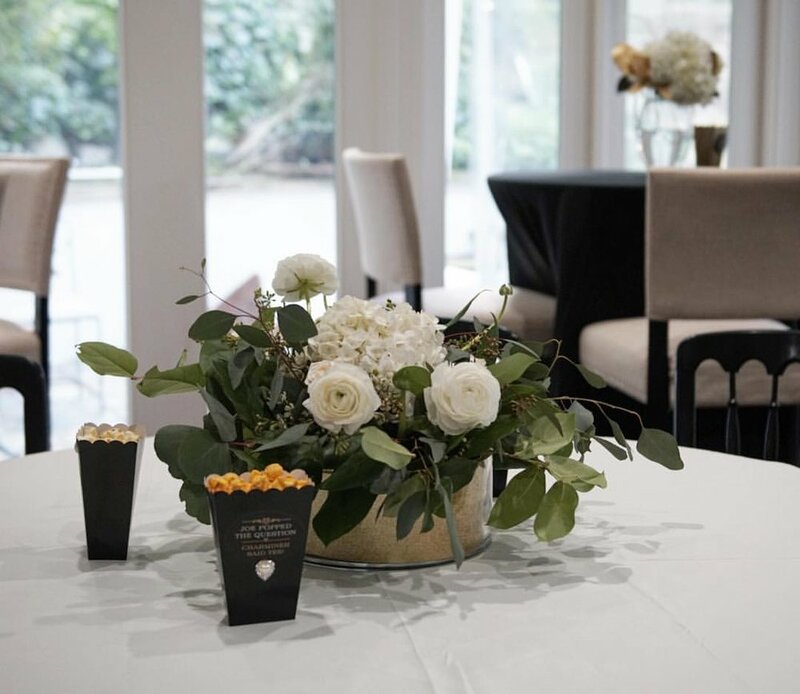 Throughout the process of reaching the client they are properly cut, hydrated and put in correct solutions to keep the flowers fresh, and are kept cold throughout the process. Heat is the enemy of most flowers (along with low humidity, drafts, and sunlight). When I picked up the hydrangeas from the grocery store, they were outside somewhat away from the sun, in 75 degree warmth, and relatively low humidity. On top of this, I have no idea how long they've been there, when the stems were last cut, or if the buckets were clean with proper solution in the water. The flowers all seemed a little sad and honestly will have a decreased vase life due to the conditions they were in. At another grocery store I have recently been to, I noticed that their flowers were hit by the blast of air every time someone walked through the front door. This is so bad for flowers! When florists receive flowers from the wholesaler, we know how long they have been there (usually they have arrived that morning after being transported in to them), and from there the flowers continue in the cold chain until being delivered to the client. So to go back to the earlier statement of getting flowers cheaper at the grocery store, remember that the extra cost from a professional florist will get you so much more: increased vase life, proper care of the flowers, the highest quality blooms, and in many cases you will be supporting a small business rather than a large corporation. Anyone who knows me understands that I have a strong love of dahlias. Actually, strong might not be strong enough of a word! So when I had full reign to design this wedding, I knew that it would be dripping in dahlias (and Juliet roses of course). It was a sunny summer day and the full and bright blooms stood their own against the gorgeous ocean backdrop. Simple, elegant, and pretty in peach. One of the best way to come prepared to put in an order for your wedding or event is to know which flowers you like (or don't like!). Although some customers are easy going and leave the flower choices up to my discretion, it can sometimes be hard to decipher what flowers a customer wants when they can only remember the color or what letter it might start with. To help us all out, I'm including a link here of a great list of flowers for reference. The list from Mayesh (a wholesaler that I LOVE and frequently purchase orders from) lists the flowers by color, season, or group type so you can look through and see what's out there. It might just be me, but who wouldn't want to peruse a flower library full of gorgeous blooms? Take a look, go back to it for reference, and enjoy! Feel free to contact me (via the contact page) with any questions, comments, concerns, or for a quote or consultation. Looking forward to hearing from you! If I were to poll my clients as to what their top five flowers are, I could safely assume that peonies would be among that list! They are a late spring/early summer bloom that have a large flowering head, so despite their often high price they are a great value. Mainly available May through July, Paeonia (commonly known as peonies) are a gorgeous and varied bloom. They belong to the Paeoniaceae (Ranunculaceae) family and are named after the Greek paionia (or Paion), physician to the gods. Although many think of the bomb or full double types of varieties, many others exist such as the single, Japanese type, anemone (a version of Japanese type), and semi-double peonies. While peonies demand a higher price than many flowers, don't be afraid to incorporate them into your wedding, event, or arrangement orders! The head of peonies can range from 3 to 8 inches across, which will fill up much more space than other lower priced flowers (and thus can equal out the price). A peony bouquet is not only classic (and also currently trendy), it's gorgeous and full while using less stems than many other bouquets. Cut peony blooms generally have a 3-7 day vase life. Always remember to add cut flower food (trust me, it works better than those wives tale flower extending remedies floating around the internet), change the water every 2-3 days, and re-cut the stems at a 45 degree angle at each water change. Keeping flowers away from direct sun (despite how pretty they look in that windowsill) and at cooler temperatures will also increase vase life. It also helps to lightly mist the blooms with water daily if the environment the flowers are in have less than 80% humidity. It's important to try to stick to buying peonies (or any flower for that matter) when they are in season. In season flowers are more available and thus have a lower price. Even if your budget is unlimited, out of season flowers tend to be smaller and not last as long. Fortunately, they are in season now and it's the perfect time to put in an order! Questions? Comments? Visit to our contact page to get in touch!